As part of Configuring App Domain, We need to create a Forward Lookup Zone. Forward Lookup Zone will use a Domain Name to find the IP Address. In our case we need an App Domain Name. Expand the Server > Forward Lookup Zone and choose New Zone. Choose the Primary Zone which is default. Leave the defaults in next pages too. We need to enter the App Domain name as the Zone Name. You can complete the wizard. In the properties enter as following. 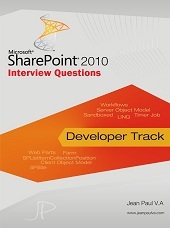 Here we are using sharepointapps.net as an alias pointing to sharepoint.windows.net which is the original computer fqdn name. Note This step is very crucial. Any wrong entry would cause the Apps to behave weird. In this post we can test the SharePoint Hosted App. Right click on the solution & Deploy the App. You can view the App by logging into the SharePoint site as the App User. You will see the App is displayed in the Quick Launch. Clicking on it will get you get the Login prompt. Enter the credentials and you will get the app launched. You may get repeated Login prompts if the Zones are configured in a wrong way.